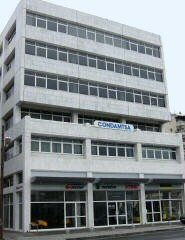 Med Marketing Ltd (eurotools) and Farmokipiki Ltd are members of the Condamtsa Group, the leading group in Cyprus in technical machinery. We invest in people, professional repair stations, continuous staff training, equipment and spare parts. We always aim for quick service to all customers with Warranty for the repair executed in the company’s authorized workshops, and repair / service visits on site whenever necessary. To further support onsite servicing, a travelling service team is on the road for visits to clients premises. Med Marketing Ltd is a private limited liability company established in Cyprus in 1974. The Directors and Shareholders of the company are Mrs. Maria Damtsa and Mr. Constantinos E. Damtsas. The company is a specialised importer and distributer of leading brands in cleaning equipment, construction machinery and outdoor care: Karcher, Metabo, Gardena, Iseki, Euro Shatal, Raimondi, Europower, Diatec, Asada, Sime and GreenMech. The headquarters in Nicosia accommodate the management and administration, as well as the central showroom and service centre. In addition to the central showroom in Nicosia, Med Marketing has showrooms in Limassol, Paphos and Paralimni as well as a network of over 80 dealers throughout the island.